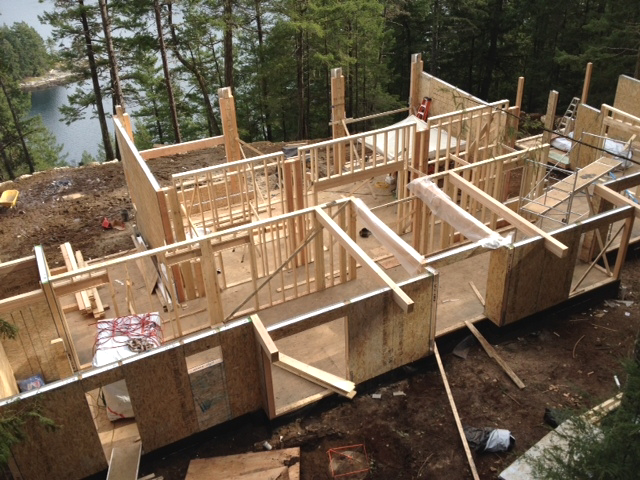 In 2014 Tamlin Timber Frame and Log Homes built a cabin on Gambier Island. Specializing in remote builds,it was built in the middle of a winter with a completion by summer. In the photo above, you can see the workers assembling the SIPs (Structural Insulated Panels). This method of construction allows builders to go from having little more than a foundation, to a structure completed to lock-up and ready for the interior trades to get to work in less than a week. While still not widely used, SIPs are a great choice for anyone looking to build on a remote property. The panels are pre-cut in a factory according to a computer-guided plan, and so allow for faster construction on site. This means considerable savings in labour costs, especially if your builders have to take a boat to work every day. SIPs construction is incredibly strong, as each panel consists of insulating foam sandwiched between two layers of oriented strand board, which allows for greater structural strength and higher insulating capabilities. While SIPs may not suit those who prefer a more traditional approach to construction, they’re definitely worth considering.